If you consider yourself a master of the yarn but have grown tired of knitting socks, sweaters, and scarves, researchers at Carnegie Mellon University’s Textiles Lab are about to breath new life into your craft with software that can turn almost any 3D model into a knitting pattern. In a pre-print paper titled ‘Automatic Machine Knitting of 3D Meshes’, CMU’s Vidya Narayanan, Lea Albaugh, Jessica Hodgins, Stelian Coros, and Jim McCann detail a methodology for converting 3D models into instructions that can be followed by a computer-controlled knitting machine which are widely used in textile manufacturing these days. A knitted Stanford bunny skin (left), stuffed and sewn shut (center), viewed from the front (right). According to the paper, a human has to tell the software where the knitting machine should start and stop on a given 3D model, but all of the other instructions are automatically generated based on an analysis of the model’s complex 3D mesh, including the path the machine should take as it does the actual knitting. The software also takes into account any limitations of the knitting machine’s capabilities, so that it doesn’t generate a pattern that could potentially jam its mechanism due to complexity, or cause the yarn to snap or tear before the knitted creation is complete. 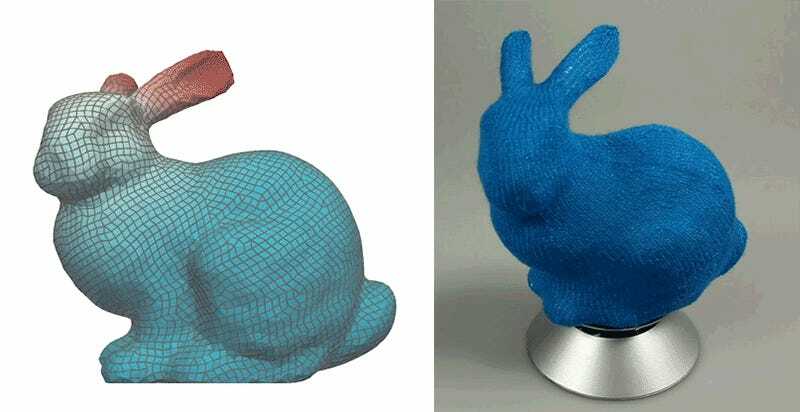 As excited as I am to start turning every 3D-printable model you can download on Thingiverse into a knitted replica, the research at CMU’s Textiles Lab has so far only focused on compatibility with knitting machines. It can’t spit out patterns for anyone with a pair of knitting needles to start working on, which is very upsetting as I need a pair of Stanford bunny slippers.